"Tyr" and "Tiwaz" redirect here. For the Anatolian sun-god, see Tiwaz (Luwian deity). For the rune, see Tiwaz rune. For other uses, see Tyr (disambiguation). The Old Norse theonym Týr has cognates including Old English tíw and tíʒ, and Old High German Ziu. A cognate form appears in Gothic to represent the T rune (discussed in more depth below). Like Latin Jupiter and Greek Zeus, Proto-Germanic *Tīwaz ultimately stems from the Proto-Indo-European theonym *Dyeus. Outside of its application as a theonym, the Old Norse common noun týr means '(a) god' (plural tívar). In turn, the theonym Týr may be understood to mean "the god". Modern English writers frequently anglicize the god's name by dropping the proper noun's diacritic, rendering Old Norse Týr as Tyr. The modern English weekday name Tuesday means 'Tíw's day', referring to the Old English extension of the deity. Tuesday derives from Old English tisdæi ("before 1200"), which develops from an earlier tywesdæi (1122), which itself extends from Old English Tīwesdæg ("before 1050"). The word has cognates in numerous other Germanic languages, including Old Norse týsdagr, Frisian tīesdi, Old High German zīostag, Middle High German zīestac, and Alemannic zīstac. All of these forms derive from a Proto-Germanic weekday name meaning 'day of Tīwaz', itself a result of interpretatio germanica of Latin dies Martis (meaning 'day of Mars'). This attests to an early Germanic identification of *Tīwaz with Mars. The god is the namesake of the rune representing /t/ (the Tiwaz (rune)) in the runic alphabets, the indigenous alphabets of the ancient Germanic peoples prior to their adaptation of the Latin alphabet. The name of the rune first occurs in the historical record as tyz, a character in the Gothic alphabet (4th century). Germanic weekday names for 'Tuesday' that do not transparently extend from the above lineage may also ultimately refer to the deity, including modern German Dienstag, Middle Dutch dinxendach and dingsdag. These forms may refer to the god's associate with the thing, a traditional legal assembly common among the ancient Germanic peoples with which the god is associated. This may be either due to another form of the god's name (Proto-Germanic *Þingsaz, meaning 'god of the thing') or may simply be due to the god's strong association with the assembly. A variety of place names in Scandinavia refer to the god. For example, Tyrseng, Viby, Jutland, Denmark (Old Norse *Týs eng, 'Týr's meadow') was once a stretch of meadow near a stream called Dødeå ('stream of the dead' or 'dead stream'). Viby also contained another theonym, Onsholt ("Odin's Holt"), and religious practices associated with Odin and Týr may have occurred in these places. A spring dedicated to Holy Niels that was likely a Christianization of prior indigenous pagan practice also exists in Viby. Viby may mean "the settlement by the sacred site". Archaeologists have found traces of sacrifices going back 2,500 years in Viby. While Týr's etymological heritage reaches back to the Proto-Indo-European period, very few direct references to the god survive prior to the Old Norse period. 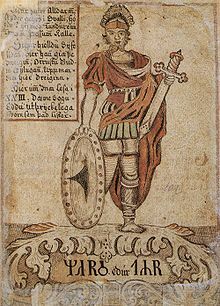 Like many other non-Roman deities, Týr receives mention in Latin texts by way of the process of interpretatio romana, in which Latin texts refer to the god by way of a perceived counterpart in Roman mythology. Latin inscriptions and texts frequently refer to Týr as Mars. Among the gods Mercury is the one they principally worship. They regard it as a religious duty to sacrifice to him, on fixed days, human as well as other sacrificial victims. Hercules and Mars they appease by animal offerings of the permitted kind. Part of the Suebi sacrifice to Isis as well. These deities are generally understood by scholars to refer to *Wōđanaz (known widely today as Odin), *Þunraz (known today widely as Thor), and *Tīwaz, respectively. The identity of the "Isis" of the Suebi remains a topics of debate among scholars. Later in Germania, Tacitus also mentions a deity referred to as regnator omnium deus venerated by the Semnones in a grove of fetters, a sacred grove. Some scholars propose that this deity is in fact *Tīwaz. A votive altar has been discovered during excavations at Housesteads Roman Fort at Hadrian's Wall in England that had been erected at the behest of Frisian legionaries. The altar dates from the 3rd century CE and bears the Latin inscription Deo Marti Thingso Et Duabus Alaisiagis Bede Et Fimmilene. In this instance, the epithet Thingsus is a Latin rendering of Proto-Germanic theonym *Þingsaz. This deity is generally interpreted by scholars to refer to Týr. The goddesses referred to as Beda and Fimmilene are otherwise unknown, but their names may refer to Old Frisian legal terms. Now Mars has always been worshipped by the Goths with cruel rites, and captives were slain as his victims. They thought that he who was lord of war ought to be appeased by the shedding of human blood. To him they devoted the first share of the spoil, and in his honor arms stripped from the foe were suspended from trees. And they had more than all races a deep spirit of religion, since the worship of this god seemed to be really bestowed upon their ancestor. By the Viking Age, *Tīwaz had developed among the North Germanic peoples into Týr. The god receives numerous mentions in North Germanic sources during this period, but far less than other deities, such as Odin, Freyja, or Thor. The majority of these mentions occur in the Poetic Edda, compiled in the 13th century from traditional source material reaching into the pagan period, and the Prose Edda, composed by Icelandic skald and politician Snorri Sturluson in the 13th century. Although Týr receives several mentions in the Poetic Edda, of the three poems in which he is mentioned—Hymiskviða, Sigrdrífumál, and Lokasenna—only the incomplete poem Hymiskviða features him in a prominent role. In Hymiskviða, Týr says that his father, Hymir, owns a tremendous cauldron with which he and his fellow gods can brew fathoms of ale. Thor and Týr set out to retrieve it. Týr meet his nine-hundred headed grandmother ("who hates him"), and a girl clad in gold helps the two hide from Hymir. Upon his return from hunting, Hymir's wife (unnamed) tells Hymir that his son has come to visit, that Týr has brought with him Thor, and that the two are behind a pillar. Hymir immediately smashes the pillar and nine nearby drinking vessels. The vessel containing Týr and Thor, particularly strong in its construction, does not break, and out of it the two gods stride. Hymir sees Thor and his heart jumps. The jötunn orders three headless oxen boiled for his guests, and Thor alone eats two of the beasts. Hymir tells the two that the following night, "we'll have to hunt for us three to eat". Thor asks for bait for so that he might row out into the bay. Hymir says that the god can take one of his oxen for bait, Thor immediately chooses a black ox, and the poem continues without further mention of Týr. In Lokasenna, the gods hold a feast. Loki bursts in and engages in flyting, a contest of insults, with the gods. 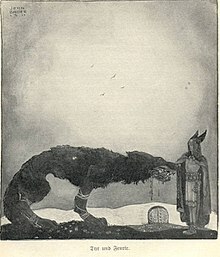 The prose introduction to the poem mentions that "Tyr was in attendance, even though he had only one hand because the wolf Fenrir had recently ripped off the other while the wolf was being bound." Loki exchanges insults with each of the gods. After Loki insults the god Freyr, Týr comes to Freyr's defense. Loki says that "you can't be the right hand of justice among the people" because his right hand was torn off by Fenrir, elsewhere described as Loki's child. Týr says that although he misses his hand, Loki misses Fenrir, who is now bound and will remain so until the events of Ragnarök. Loki's response contains an otherwise unknown claim about Týr's otherwise unidentified consort: "Shut up, Tyr, my son came from your wife. And you haven't been paid a penny or an ell of cloth as recompense for this, you rat." High said: 'There is also an As called Tyr. He is the bravest and most valiant, and he has great power over victory in battles. It is good for men of action to pray to him. There is a saying that a man is ty-valiant who surpasses other men and does not hesitate. He was so clever that a man who is clever is said to be ty-wise. It is one proof of his bravery that the Æsir were luring Fenriswolf so as to get the fetter Gleipnir on him, he did not trust them that they would let him go until they placed Tyr's hand in the wolf's mouth as a pledge. And when the Æsir refused to let him go then he bit off the hand at the place that is now called the wolf-joint [wrist], and he is one-handed and he is not considered a promoter of settlements between people. Then will also have got free the dog Garm, which is bound in front of Gnipahellir. This is the most evil creature. He will have a battle with Tyr and they will each be the death of each other. 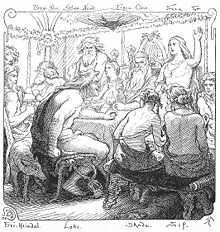 Skáldskaparmál opens with a narrative wherein twelve gods sit upon thrones at a banquet, including Týr. Later inSkáldskaparmál, the skald god Bragi tells Ægir (described earlier in Skáldskaparmál as a man from the island of Hlesey) how kennings function. By way of kennings, Bragi explains, one might refer to the god Odin as "Victory-Tyr", "Hanged-Tyr", or "Cargo-Tyr"; and Thor may be referred to as "Chariot-Tyr". Section nine of Skáldskaparmál provides skalds with a variety of ways in which to refer to Týr, including "the one handed As", "feeder of the wolf", "battle-god", and "son of Odin". The narrative found in Lokasenna occurs in prose later in Skáldskaparmál. Like in Lokasenna, Týr appears here among around a dozen other deities. Similarly, Týr appears among a list of Æsir in section 75. In addition to the above mentions, Týr's name occurs as a kenning element throughout Skáldskaparmál in reference to the god Odin. The motive from the Týr bracteate from Trollhättan, Västergötland, Sweden. Drawing by Gunnar Creutz. Scholars propose that a variety of objects from the archaeological record depict Týr. For example, a Migration Period gold bracteate from Trollhättan, Sweden, features a person receiving a bite on the hand from a beast, which may depict Týr and Fenrir. A Viking Age hogback in Sockburn, County Durham, North East England may depict Týr and Fenrir. Due in part to the etymology of the god's name, scholars propose that Týr once held a far more significant role in Germanic mythology than the scant references to the deity indicate in the Old Norse record. Some scholars propose that the prominent god Odin may have risen to prominence over Týr in prehistory, at times absorbing elements of the deity's domains. For example, according to scholar Hermann Reichert, due to the etymology of the god's name and its transparent meaning of "the god", "Odin ... must have dislodged Týr from his pre-eminent position. The fact that Tacitus names two divinities to whom the enemy's army was consecrated ... may signify their co-existence around 1 A.D."
Similar descriptions of runes written on swords for magical purposes are known from other Old Norse and Old English literary sources, though not in what seem to be religious contexts. In fact very few swords from the middle ages are engraved with runes, and those that are tend to carry rather prosaic maker's formulas rather than identifiable 'runes of victory'. The call to invoke Tyr here is often thought to have something to do with t-runes, rather than Tyr himself, given that this rune shares his name. In view of Tyr's martial role in Norse myth, however, this line seems simply to be a straightforward religious invocation with 'twice' alliterating with 'Tyr'. ^ a b Reichert (2002:398). ^ Such as throughout Faulkes's translation of the Poetic Edda (1995). ^ See discussion in Barnhart 1995:837 and Simek 2007:334, 335-336). ^ See discussion in Turville-Petre (1964:181) and Simek (2007:203). ^ a b c Dodds 2014:90-95. ^ a b Dodds (2014:102-103). ^ a b Faulkes (1995:59). ^ See discussion in, for example, Davidson (1993:39-41). ^ MacLeod and Mees (2006:239). Mierow, Charles Christopher. (Trans.) (1915). The Gothic History of Jordanes. Princeton University Press. Turville-Petre, E. O. G.. (1964). Myth and Religion of the North. Greenwood Press. Look up týr in Wiktionary, the free dictionary. 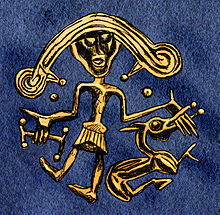 Wikimedia Commons has media related to Týr. Look up Tyr in Wiktionary, the free dictionary.